Teenage sprinter Dina Asher-Smith has set a new women's British 100m record. The 19-year-old from London clocked 11.02 seconds at the World Challenge Meeting in Hengelo in the Netherlands to finish second behind home athlete Dafne Schippers, 22, on 10.94 seconds. But that was enough for Asher-Smith, in her first 100m race of the season, to break the 11.05 second British record set by Montell Douglas in 2008. Asha Philip, 24, was third in a third-fastest British time of 11.10 seconds. 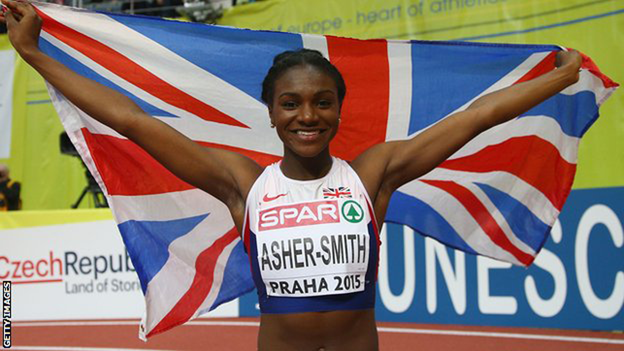 Asher-Smith is the current World 100m Junior Champion and won a silver medal in the European Indoor 60m in March. Dutch athlete Schippers also took the gold that day.